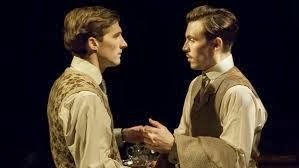 This month I would like to recommend you to see Versailles at Donmar theatre in London ( click here ). I will not attempt to be a theatre critic , I can only say the play is excellent and I enjoyed it thoroughly. My first time at Domar (aka The Best Theatre In The World) has left me wanting to see more plays there. If you are a huge theatre fan it doesn't get better than this. You have been warned! Versailles is a play that requires a bit of historical knowledge, some called it 'lecturing but not patronising' but I call it interesting and keeping you on the edge of your seat'. The play is multilayered with complex characters, all of them unique in their own way and interesting. I must say sitting in the first row helps a lot to enjoy the play more, some will disagree but this is my personal opinion. The play leaves you with this cathartic feeling that you want to experience in theatre, a sign of a good play and makes you think about it long afterwards, another sign. I cannot recommend more seeing this play and if is the only one play you will see this month or year, this one will be very memorable. I have managed not to divulge any details about what happens in the play (I always like not to know anything before seeing it) but if you want to find out more about it click here and here. Would love to visit! Unfortunately I won't be in London anytime soon..